Secure 4-Port keyboard-mouse switch with USB 2.0 sharing. The SKM-04 enables users to manage and switch KM (Keyboard and Mouse) functions of four connected computers, including multi-head computers. With support for multiple displays per computer, users can create the ultimate KM environment. This can be a superior solution to operating a KVM switch, especially among multi-head computers. 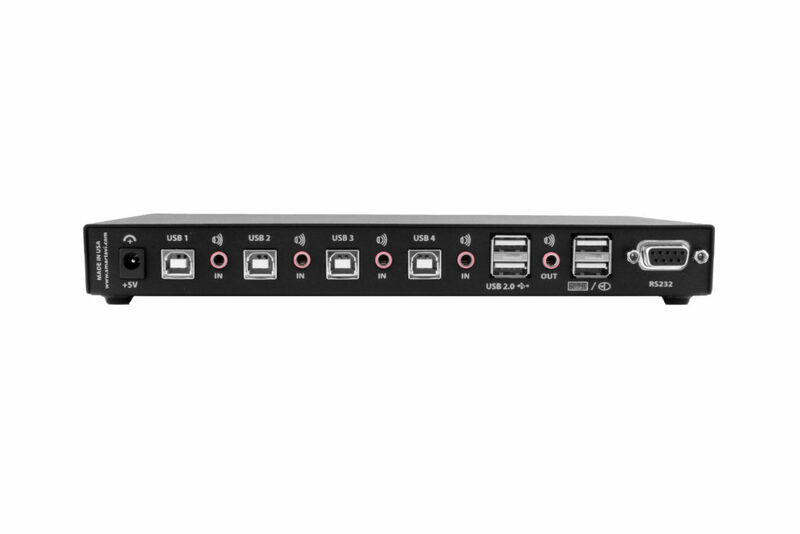 Users can simply connect the monitors directly to the computers and use the SKM-04 to switch between computers for KM operation. The SKM-04 is completely driverless, requiring no software or updates (although the device has the capability for firmware updates). It is compatible with virtually any PC and all major operating systems without the need for software downloads, and it supports all USB 2.0 devices. 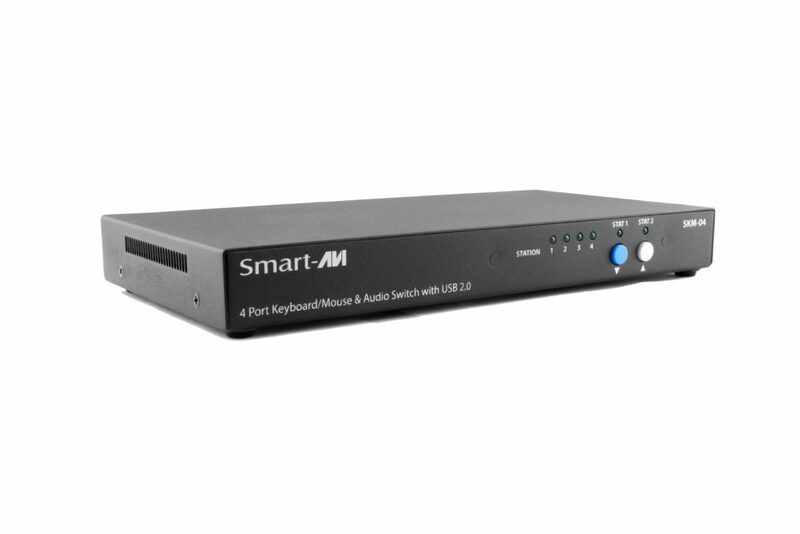 With full USB keyboard and mouse emulation, the SKM-04 delivers the utmost in user-friendly operation. Furthermore, the device enables users to control KM functions on one computer while maintaining the connection of other USB peripheral devices on another connected computer simultaneously, without interruption for improved workflow. Users can switch inputs via the buttons on the front panel or hot keys. The SKM-04 is the first KM device on the market to offer RS-232 control. Users can also switch using a double click of a mouse’s center button (known as Mouse Gesture Switching). In single-head mode, users can switch computers with SmartAVI’s new PASS (Progressive Automatic Screen Switching) technology, which enables the device to automatically switch computers based on where the user’s mouse goes. 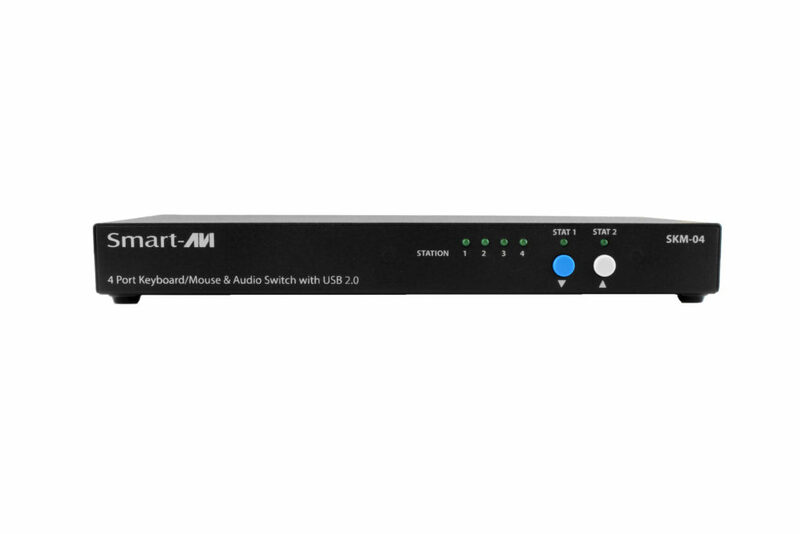 It’s a quick, efficient and intuitive way to provide smooth switching that corresponds with a user’s cursor movement. The SKM-04 allows up for numerous displays to be used with its four connected computers. That means multiple multi-head computers can be managed with no drivers required. 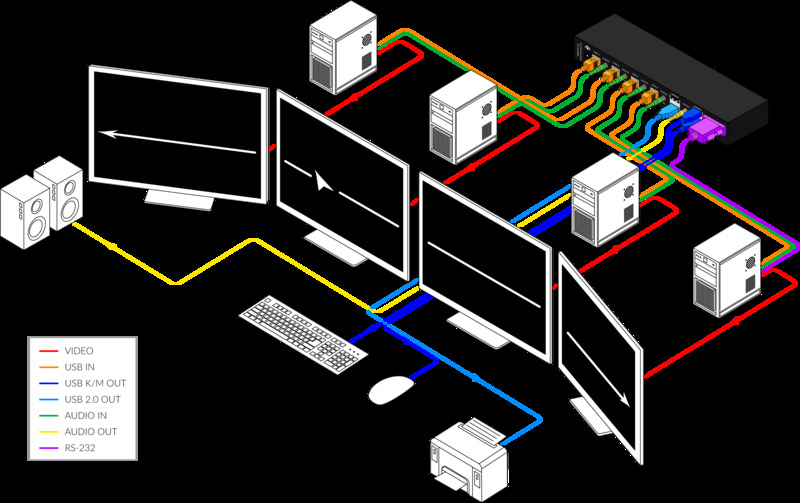 Users can connect up to four computers, for example, each with up to 16 screens. Pictured below are three such examples of the SKM-04’s functionality, including two multi-head computer layouts. PASS is not available when using multi-head computer configurations, but users can easily switch using the device’s other supported switching protocols, including Mouse Gesture Switching.